Citing public safety concerns, more Massachusetts cities and towns are halting or delaying non-emergency gas work following National Grid’s lockout of 1,200 of its most experienced employees. Among the communities temporarily stopping or reviewing non-emergency natural gas projects are Somerville, Lowell, Braintree, Medford, Malden and Haverhill. 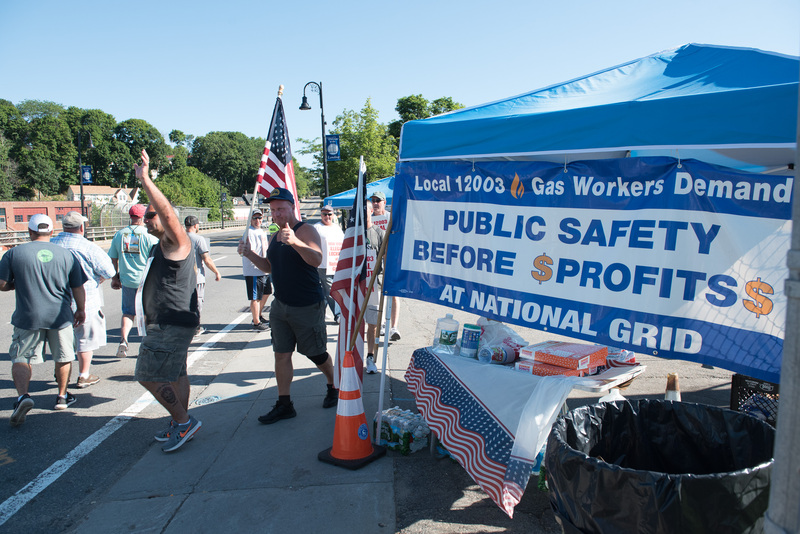 These decisions come as the gas workers of USW Locals 12003 and 12012 continue to observe significant safety violations by management and replacement contractors after National Grid decided to lock out its experienced workers on June 24th. In Lowell, city councilors also raised safety concerns during a recent city council meeting. “I don’t like workers being locked out from their jobs…I have concerns about employees and oversight. There are some issues of risk,” Lowell City Councilor Rodney Elliot reportedly said during that meeting. And the town of Braintree issued a resolution in support of gas workers that calls for increased safety inspections and no new permits for gas construction projects during the lockout. In all, more than a dozen safety violations have been reported to the Department of Public Utilities since the beginning of the lockout. A variety of safety violations have been observed since the lockout began. In Lowell, a third-party contractor was twice observed excavating within 200 feet of a National Grid high pressure regulator pit, and without a National Grid inspector onsite. A backhoe in Malden operated by a company contractor was photographed driving on roads without registration, license plates, or any identifying information. In Amesbury, National Grid replacement workers filled emergency valves with sand in violation of the company’s own operations and maintenance manual. These valves must be kept clear so that gas can be quickly shut off in case of emergency. USW Locals 12003 and Local 12012 represent about 1,250 gas workers in more than 85 Massachusetts cities and towns. It’s unclear why National Grid chose to lockout workers in 2018. The unions’ previous contract with National Grid expired in February 2016. A new contract was not ratified until five months later in July. There was no lockout during that time because National Grid agreed to the unions’ contract extension offer, which allowed experienced workers to continue doing their jobs.